Make your victim think that his or her car got scratched by placing a sticker that looks like a car scratch. Be sure to stick is prominently near the car door handle of the driver's door. Your victim will likely freak out until he or she inspects the 'damage' more closely. This prank idea will make your victim think someone shot at his or her car. You'll need a balloon and a bullet hole car sticker. Blow the balloon large enough to be loud when it pops. Then tape it to the rear tyre that is opposite of the passenger side of the car. Now place the bullet hole sticker (or stickers!) above the area where the balloon is. When the balloon pops and your victim comes out to check, your poor victim may just jump to conclusions and believe that the car was shot at. The saran wrapped car is a safe classic prank you can pull on a car. The idea is to get a few rolls of plastic wrap (the ones used for food) and wrap the entire car with it. It's best played on the weekend when your victim is not likely to be rushing off to an important appointment. Want to box up a car for your victim? Try out this crazy but safe car prank. Get the maximum width, length and height measurements of your victim's car with a measuring tape. Add about 5 inches to these lengths when you head off to purchase plywood to construct your box around the car. You'll need 5 large pieces - 2 for the sides of the car, 1 for the top, 1 for the front and one for the back. Be sure to prepare your wood for easy assembly with long screws. Make sure you've tried to assemble it in another location and have drilled the appropriate screw holes into the plywood. On the day of the prank, assembly of the car box should be a snap. To take it one more step, purchase bulk gift wrap and wrap the box. Be sure to add a ribbon to your wrapping handiwork. This is a safe car prank, no doubt, but it can be a little embarrassing for your victim. It involves placing objects in your victim's car that can be noticed by passers-by. For example, you can place an inflatable adults dummy in the passengers seat or leave adult toys on the dashboard of your victim. This is a simple and safe car prank. Put some Vaseline under or behind the car door handle so that it's out of sight. When your victim tries to open the car door, he or she will get a handful of the stuff. Do you want your victim to go nowhere really fast? Jack up a car with the help of a hydraulic jacks, then balance the car on cinder blocks or bricks so that the wheels are hovering about an inch off the ground. Of course, remove the jacks before you go. When your victim tries to drive the car, the wheels will spin but the car goes nowhere. No traction, no movement! 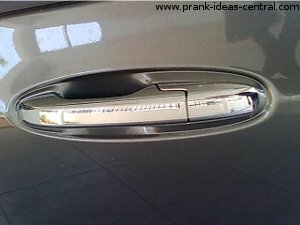 Here's a funny and safe car prank that you can use on several victims. Make a car accident apology note, something like "I'm sorry I drove into your car today. I'll do anything to make it up to you. Please call me at . Regards, ". Be sure to enter the details of the person you want to prank. Then go ahead and randomly distribute copies of this note on the windshields of parked cars.